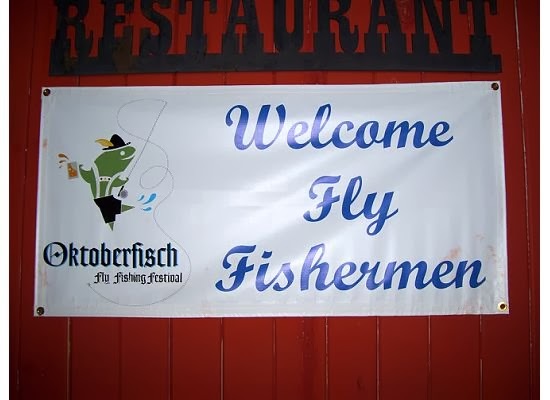 The Fredericksburg Fly Fishers know how to host an event! 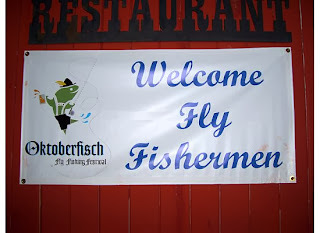 This was the 8th annual Oktoberfisch with the 5th one in Junction. Of the eight events, I have attended five--one in Mason and the other four in Junction. I never tire of this event and love coming to Junction. Cody and I have really formed a routine that we love, from setting up camp to leaving town. Sometimes, Friday nights find the Junction Eagles playing a home football game; this year, though, they were on the road. So, instead of sitting under the Friday Night Lights, we hit Isaak's Restaurant with many friends, discussing all aspects of fishing, including the SOC Conclave. We enjoy the down-home, no one's a stranger atmosphere at Isaak's, and the Friday night all-you-can-eat catfish is a heaping mound of goodness. Right after kayaking under the Park bridge, there is an outward bend on the southern side of the river with some nice shaded areas along the bank. I always fish this spot, and if I catch a fish here, I know I'm going to have a great day on down the river. I had predetermined that my theme for this year would be that I would fish flies tied and given to me by someone else. On Saturday, there was the largest hatch of Pale Morning Duns I have ever seen on a water body. Due to this hatch, I tied on a pretty little white popper tied by my friend Mark Wegmann. The last DFF auction Norm auctioneered, many of Gracie Liu's fly tying materials were in the silent auction. Unbeknownst to us at the time, Mark and I were bidding against one another. When we discovered that it was us driving up the price for the other, we decided to call a truce, and I let Mark win the items. As a result, Mark had tied three of his poppers and gave them to me the last night we were building rods at Norm's before Norm passed away, and so that's how I came to have this fly. I am not very successful with poppers, but with that wild hatch occurring, and for such a long time, too, I just knew I couldn't fail. Second cast to my tell-tale spot, and a beautiful little Redbreast Sunfish was on the end of my line. I had many more hits, but I couldn't close the deal, and as the sunrise began to dissipate the hatch, I needed to switch flies. Thank you, Mark! On Friday evening, the Fredericksburg folks hold an orientation meeting. At this year's talk, white and orange were the pattern colors they said would be successful. So, keeping that information in mind, I tied on one of Jonathan Gonzalez's beadhead midge/WoollyBugger patterns in crawfish orange, with a hint of a clear-purplish mylar tail. I was demonstrating catching fish on a fly rod in the Catfish tank at Fly Fish Texas in 2009, and had nothing small or brownish in color, which is all those 20lb. plus fish were eating that day. Jonathan was demonstrating fly-tying in the pavilion. A member came by and asked if I needed anything, and I asked him to send word to Jonathan to tie me up something about the size of one of those catfish pellets they were selling. So the fellow member took a pellet to Jonathan, explained that is all they were eating, and I needed something tied that they would eat. In about seven minutes the member came back with several flies in different colors, which caught catfish aplenty, and that is how I came to have this fly. Thank you, Jonathan! Cody Bell was a good 1/4 mile downriver and encountering no traffic or pressure, unlike myself. He buzzed me on the walkie-talkie, explaining that there was a nice, clear cove to which he had all by himself, but that he'd love to have some company. I paddled on downriver passed the park boundary, away from other folks, passing up some good spots, and found Cody. The cove was clear, surprisingly! (Most of Texas had received a desperately-needed, good rainfall the first of that week; Junction specifically received 5 inches of rain--Sah-lute! As a result, a lot of the downstream water was definitely tea-stained, but productive.) I fished the shady, tree-lined shore, and it was bream time. I caught two more Redbreast Sunfish and a Longear Sunfish on Jonathan's fly, but I seemed to lose the bite. So, seeing as I was with my man, it was time for the GirlieBugger. In 2009, Cody and I were River Helpers for the North Texas Casting for Recovery retreat in Glen Rose. Cody wanted each of the ladies participating to have a little something from him, seeing as he's just a little partial to breast cancer survivors because his mom and wife are both survivors. Cody ties a fly known to many as the CodyBugger, and that fly catches a lot of fishes in both fresh and saltwaters. So, Cody decided to adapt the CodyBugger for the retreat. Seeing that the CfR colors are pink and purple, Cody changed from a brass conehead to a hot pink conehead, and thus, the GirlieBugger was born. It also catches a lot of fishes, and Kevin Hutchison says it looks similar to an egg-sucking leech. So, that's how I came to have a CodyBugger. I decided I would continue hitting that shady shore, and first cast, it was Rio Grande Perch time. (Oktoberfisch is Guadalupe Bass and Rio Grande Perch, and if those were the only two fish I caught the whole trip, that would be fine with me.) The GirlieBugger hammered the Rios, and this year, even though water levels had been low due to our 30-year drought, almost no Rios had those harmless, bacterial sores on their bodies. They were some of the prettiest Rios I had seen in a while. Cody abandoned his spot, and came down there by me. I told him what shaded area I had not fished, and so he cast his CodyBugger, 4lb. tippet line into a sweet little spot, and pulled out a nice 1.25lb Largemouth Bass. That isn't a Lunker by any means, but when it's on the end of a small tippet/leader set-up on a 2# rod, it fights like it is a lunker. Oh, it was fun to watch. Time to mosey on downriver; otherwise, this little 5-mile stretch would take 10 hours to float. Cody picked another cove just off another rapid, and it was fine business. The river actually split and had a nice little shoot that emptied in to the cove. I was envying some of those pretty Guadalupe Bass Cody had been catching, so I was fishing the outer edge of the faster water. I heard a fine splashing, and up in the weedbed, I heard a fish jump. I still continued to fish the faster water, but I was watching the bed, and lo and behold, it was a Rio jumping. I have never seen a Rio jump until then, and he was piggy big. Well, I just had to call out to him that I was coming, hold on to his feeding frenzy thoughts. I cast to where he had jumped last, and Bam! RioOn! I called out to Cody to come look at The Prize--Rio #4, and didn't realize, two buddies in a canoe had beached and were fishing the top of the shoot. He saw that p-i-g HOG Rio and gave a holler, too. Thank you GirlieBugger and Rio Grande Perch! Now, Cody and I were beginning to envy one another--I, Cody's Guadalupe Bass, and Cody, my Rio Grande Perch, so we moved on down to where we hoped our envies would be laid to rest. We fished some more but with little luck, and came upon a nice spot with rapids rumbling right in front of us, so at 12:30, we had lunch. After finishing our Stripes' sandwiches, fruit (not Cody) and such, it was time to go. The crowd was still behind us, and we didn't want to get caught up in leap-frog fishing. Cody told me to go first, so I paddled upstream to align the kayak so I could properly shoot the rapid (and I needed every advantage, because this little slew was where my 8# rodtip was snapped and I lost my hat last year), and as I'm floating by, Cody exclaims he forgot to adjust his oars and for me to go on down, he'd catch up to me. One canoe had already past, with a kid in it, and no problem. What makes this little class 1 rapid daunting, is that the fast water is right up against the left bank, and there are huge grasses growing out of the side. Last year, those grasses hid a rather unfriendly tree branch about eye-level high. As a result, instead of ducking or using the paddle to push the grasses aside, people have a tendency to push away from it, but once someone does that, the current and the submerged tree creating the rapid, causes the craft to capsize. Believe it or not, this rapid is deep, and the eddy's swirls are obviously visible and numerous. The canoe with the kid had beached and man and boy were fishing the outside bend riffles as I floated by. Then, another kayak came by, and it was one of the fellows who put in at the Park just ahead of us. I was wondering what Cody was doing, and why he wasn't coming on down. Cody comes over the walkie-talkie and says, "Come back. Rescue the green water bottle and yellow kayak floating unmanned down the river." I replied, "What? Come again? What did you say?" Cody starts to repeat himself, but then cuts himself off saying, "Oh, I gotta go; I gotta save someone." Click. Dead silence. I had started paddling back upstream passed the kayaker, passed the boy and man fishing, who were not too happy with me for spoiling their fishing spot. I see the green water bottle and kayak, and grab the bottle, position my kayak to intercept the yellow Ocean Kayak and paddle to shore. I beach my 'yak, and start walking upstream to where Cody had been with the unmanned kayak in tow. The man in the other kayak had beached his and started walking upstream as well. The current was swift, chilly, and hip-high. Then, I see Cody and a rather tall (6'3") man walking along with him. I was having to look down to power wade across the river, so I wasn't paying attention. The other 'yaker said he'd take the kayak from me, but I was curious, so I told him I had it. I gave the tall man his kayak, and then I noticed he was wet from head-to-toe. The man asked me about a fly rod, and I told him that I had not seen one. He took the kayak from me, walked over to his buddy, beached the kayak, and began talking. He told his buddy that he believed he had almost died. He said he flipped his kayak at the rapids, and something was pulling him under. He chuckled and said that at least the sit-on-top kayaks flip back up quickly and easily, which was better than what he did. He then said he was frantically holding on to the grass, trying to breathe, but was sinking and didn't know what to do. Cody waded in the water and told the man to grab his hand. The gentleman was reluctant at first, but on Cody's second request, the gentleman grabbed Cody's hand and came upon the shore. We waded along the river, looking for the missing fly rod. Cody went back to the spot where the kayak flipped. The rod was a 9 foot rod, so Cody was checking the river every 9 feet. He found the rod right where the capsizing occurred, caught in the submerged tree. Man and rod rescued, we returned to our boats and fishing. About 20 minutes later, the two men came floating by as Cody and I were hammering the Rio Grande Perch. We continued kayaking and fishing down the river, through the deep channels and weed beds, which were so tempting, but we were paddling against time. Cody did tell me I needed to try a Bass Brunch, so I tied one on, and first cast, FishOn! We also chose to fish the area just across from Shady Morgan Campground, and I caught a White Crappie, a South Llano River first for me. We beached our boats and made it to the Saturday night Ribeye cooked by the Mexia FFA group, and it was delicious, as always. Cody and I won no raffles this year, but it was fun, nonetheless. On Sunday, we decided to head to Crossing 1, and we fished some nice little riffles, but those Bluegills were very educated. We moved farther down to Crossing 2, and Cody found a sweet little honey hole that harbored the Guadalupe-Smallmouth Bass Hybrid. That 2 pound bass put an excellent bend in my 2# rod. I looked for more hybrids, but no more took my CodyBugger. We packed it in and headed to Boone's Crossing, the place where I caught my very first Guadalupe Bass. Cody and I split up, and I headed up the northern chute. I really wanted a Guadalupe Bass, since they had been so few for me on this trip. I found a spot so like A River Runs Through It, that I had to take a picture of the spot. It was a one cast shot, and the Guad did not disappoint me. I cast to many fishy areas but caught no more fish. Cody fished the crossing, and he cast to a Rio Grande Perch, when a Guadalupe Bass chased the Rio away, ate the fly, and got caught. Of course, Cody released him only to be rewarded with a Rio Grande Perch at the end of his Clouser. As always, our Oktoberfisch 2011 trip was a blast and a reward. The South Llano River is our favorite river, and this year, we believed we had an additional purpose for being at Oktoberfisch. Until next year, we hope the South Llano and its fishery survive the drought well.